Conduct annual beach monitoring, water quality sampling and beach clean-up events. Expanded dune restoration at public beaches and improve public access. Coordinate hazardous waste collections including electronic waste, old/unwanted medications and more. Collaborate on coastal wetland mitigation, restoration and protection projects. Assist with large scale coastal protection and restoration planning projects. Provide technical assistance and rain barrels cost-sharing for household water conservation. Educate K-12 students to be Great Lakes Stewards and provide university internships. Public education campaigns. Take the Stormwater Challenge! Building New Trails and New Partnerships! 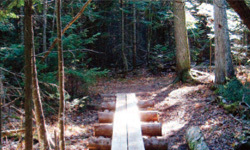 Thanks to support from the Marquette Board of Light and Power the SWP has partnered with the Noquemanon Trail Network (NTN) to build a series of new multi-purpose trails in the Dead River Watershed. Many of these new trails include stunning views of waterfalls, rapids and other natural features. The new trails will also improve public access and connect to several existing NTN trail networks. For more information contact the SWP or NTN. The Superior Watershed Partnership works with UP local units of government to to develop a variety of land use planning ordinances, including regulations to protect urban waterways.Preserving a relatively narrow strip of land along streams and rivers—land that is frequently less suitable for other uses—can help to maintain good water quality, provide habitat for wildlife, protect people and buildings against flood waters, and extend the life of reservoirs. The Riparian Buffer Implementation Plan is an example of how the SWP assists UP local units of government protect natural resources. 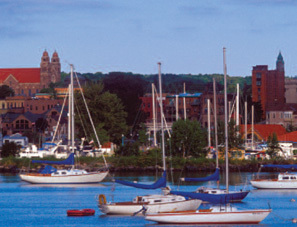 During 2004, the Superior Watershed Partnership, in cooperation with The Cedar Tree Institute, approached the Bishops and religious leaders from nine faiths across the Upper Peninsula to sign an Earth Keeper Covenant agreeing to make a commitment to environmental stewardship addressing pollution prevention and toxics reduction. Currently, over 140 congregations from 50 U.P communities participate in the Earth Keeper Coalition. Other Earth Keeper partners include, but are not limited to, The Cedar Tree Institute, the Keweenaw Bay Indian Community, The Nature Conservancy, and Northern Michigan University. Over 3 million lbs. of carbon reduced in 2008. 1+ tons of unwanted pharmaceuticals collected for proper disposal in 2007. 320+ tons of defunct computers and other electronic items collected in 2006. 45+ tons of hazardous household products collected in 2005. Since 2008, the SWP has a position on the Marquette’s Ad Hoc Committee on Sustainability.